From the 25th - 30th March Duffield will see a host of activities and events aimed at the over-55s, or those caring for older people, as part of the Good Neighbour project's first "Good Neighbour Week". Duffield Parish Council's Full Council meeting on Wednesday 6th March will be held at the Cemetery meeting room on Hazelwood road, rather than at its usual venue the Weston Centre. The meeting starts at 7pm, all are welcome to attend. If wishing to speak at the meeting please see our public speaking policy below. The meeting agenda is also attached below. Parish and Amber Valley Borough Councillors, Steven Evanson and Chris Short, are holding another of their monthly Councillor Surgeries this Saturday. The surgeries are held on the first Saturday of every month at the Weston Centre, Duffield between 10:30 and 11:30am, the Councillors will be on hand to hear residents' concerns about issues in the village and further afield. Don't forget your bin collection day changes this weekend! For most Duffield residents, if your general waste collection is usually on Monday then this will be changed to Saturday this weekend only - so instead of Monday 24th it will be Saturday 22nd. The bin needs to be out at the roadside for collection by 6:30am. 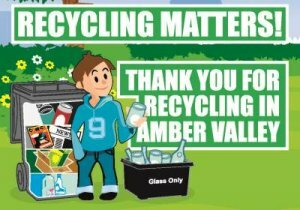 The next date, Monday 31st will see recycling collected as normal.